There are many options to buy bitcoin and it’s hard to assess which one it’s the right one. Some look great, but have high fees. Others don’t support cheap ways of funding your account (like SEPA bank transfer in the EU, which is a bit slower, but cheapest). Here’s a review of one that does that, for a not so bad fee and is very simple to use: Coinmate.io. 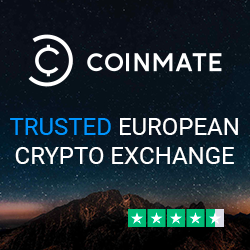 Coinmate.io is registered in London, although from their offer of services and currencies, they strike me more as a company focused on EU, maybe eastern EU market (offering CZK as one of their two currencies for example – CZK isn’t used anywhere but the Czech Republic, therefore it’s not a choice to go internationally, but locally). Their side project – Bitcoin payment gateway BitcoinPay also seems to be used by a few eastern european companies, therefore the London office might not reflect the reality of where the team comes from or their main focus countries. This isn’t anything bad, I just like to know where do the companies actually come from. They offer a very easy way to buy bitcoin and also trade it – Buy/Sell interface and Trading interface. They are a good option to buy Bitcoin for less technical users, or if you’re from Czech Republic (or hold CZK). Ease of use trumps slightly higher fees if you’re into less complicated and technical user interfaces. The layout is very simple and geared to wards no clutter, just key options you need. Very easy to use for average – non technical users. Everything is clear on the page, no clutter, you click buttons and are guided through clear screens. You can deposit via SEPA which is the most handy option for EU residents and the fee isn’t too bad. There’s no credit card option. SOFORT or MoneyPolo options are there, although I’ve never used them here or on any other exchanges, therefore not sure what their fees and exchange rates are. I’m a SEPA fan :). You can also deposit BTC or LTC. Not having USD takes their rating down. EUR is a must, including CZK is a strange choice as it’s a small market. Kinda tells me that the founders are from Czech Republic. So if you’re Czech or hold CZK – great, no deposit fee – but that’s a small market. In EU – GBP would certainly help, and of course USD for international customers. This is fairly average – done through IDnow either by scanning documents via a mobile app or your webcam. Could be made easier by just uploading copies of documents instead, but it’s pretty standard anyway. Nowadays it helps to have more options – especially if BTC has high fees. You can buy and trade BTC or LTC. I’m missing other key players – ETH, BCH, DASH, ETC, XRP. But as the banner suggests – it’s not about trading cryptocurrencies, but Bitcoin, which they do well. At the time of writing, you could buy 1 BTC for 9,500€ at coinmate.io, compared to bitstamp.net 9,300€, which is quite a difference (>2%). I guess you pay for convenience – bitstamp’s price is better, but it’s harder to use, compared to coinmate.io user-friendly interface. Coinmate.io is not a bad choice for users who prefer simplicity and nice interface, to buy bitcoin and don’t mind to pay slightly more because of it.